Stephanie Osborn’s best selling SHERLOCK HOLMES AND THE MUMMY’S CURSE is now an award winner. The first book in Osborn’s Gentleman Aegis series within Pro Se Productions’ HOLMES APOCHRYPHA imprint was recently awarded the 2016 Killer Nashville Silver Falchion Award for Best Nonfiction Young Adult Book. Osborn’s thrilling tale of Holmes’ and Watson’s early years as a team fell into the award category due to it being historical in nature, even though not completely non fiction. SHERLOCK HOLMES AND THE MUMMY’S CURSE occurs within the first year of the famous friendship of Holmes and Doctor Watson. They are still finding their way in the world, with all the troubles that such young men usually have: Financial straits, troubles of the female persuasion, hazings, misunderstandings between friends, and more. Watson’s Afghan wounds are still tender, his health not yet fully recovered, and there can be no consideration of his beginning a new practice as yet. Holmes, in his turn, is still struggling to found the new profession of consulting detective. Not yet truly established in London, let alone with the reputations they will one day possess, they are between cases and at loose ends when Holmes' old professor of archaeology contacts him. 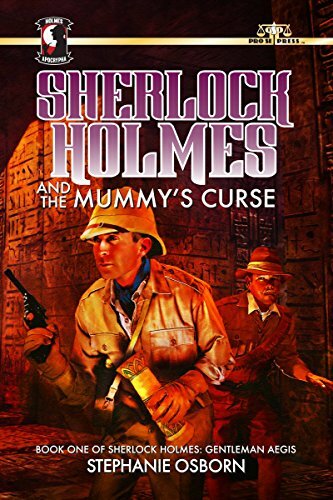 With a stunning cover by Jeffrey Hayes, SHERLOCK HOLMES AND THE MUMMY’S CURSE is available via Amazon in print currently for $13.66 athttps://www.amazon.com/Sherlock-Holmes-Mummys-Curse-Gentleman/dp/1518883125/ref=tmm_pap_swatch_0?_encoding=UTF8&qid=1472324522&sr=8-2. Osborn’s award winning book is also available for the Kindle at https://www.amazon.com/Sherlock-Holmes-Mummys-Stephanie-Osborn-ebook/dp/B017IX33NW/ref=tmm_kin_swatch_0?_encoding=UTF8&qid=1472324522&sr=8-2#nav-subnav. As of August 27, 2016, this title is #38 on the Amazon Pulp Bestseller list.